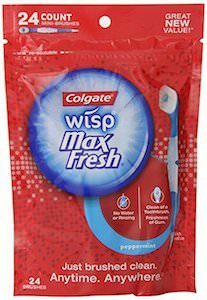 No longer do you have to worry about taking toothbrush and toothpaste on your trip as you can just throw a bag of Colgate Disposable Travel Toothbrushes in you bag. The toothbrushes comes in a pack of 24 and they have peppermint flavoured toothpaste build in and on the end of the toothbrush there is a little tooth pick to to remove those stuck pieces of food. Sure it maybe a bit wasteful but it is really handy as you never have to worry about having the right stuff with you and as you also don’t need water for rinsing it is just ideal for camping. This toothcare set includes a travel toothbrush and toothpaste making it ideal for your next trip. The travel toothbrush stores the toothbrush head in the handle when not in use so that you don’t have to worry about dirty getting on your toothbrush and it also will take up less place in your luggage. 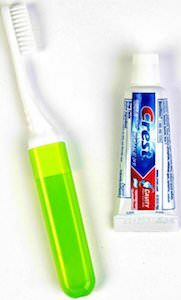 Besides a toothbrush, you will need toothpaste too and that is why this set includes a small tube of Crest toothpaste and it is big enough for your trip but too small for everyday use at home. Thanks to this toothcare set you don’t have to have dirty teeth and a smelly breath and those are important while enjoying your holiday. Bringing a normal toothbrush on your trips is kinda annoying and that is why the people from Gum made this foldable toothbrush that is made especially for people on the go. The toothbrush folds into the handle when not in use and that makes for less of a mess in your luggage or maybe even you handbag if you want to brush where ever you are. 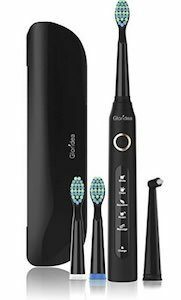 And you get 2 On-The-Go toothbrushes in this set so you can even give one to a friend or have a spare one ready for you next trip.